My All-Clad Stainless Steel Cookware Set Review awards it for the Best Quality stainless steel cookware set. It can take your cooking to the next level. This healthy, nearly indestructible, dishwasher safe, stainless steel cookware set is built to last a lifetime. 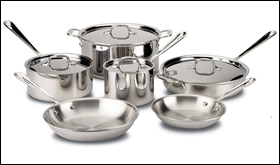 All-Clad is a premiere American bonded metal cookware manufacturer. Used in countless restaurants, All-Clad stainless steel cookware can help any home cook make the tastiest meals. People who have new cookware enjoy cooking even more! Perhaps you have mismatched cookware or some that is chipped or peeling. Perhaps you have some old scratched nonstick and concerned over health reasons. Maybe they are slightly warped and don’t lay flat. Maybe yours sticks too much, doesn’t perform the way you would like it to, and perhaps you want a cookware set that is healthy. You may have noticed scratches on the cooking surface, your current cookware handles get too hot, or it is too heavy. Perhaps you would like some that is dishwasher safe and easy to clean. In reviewing stainless steel cookware sets, I found one that stands above the rest when it comes to PREMIUM QUALITY. There are many brands to consider including All-Clad, Calphalon, Cuisinart, Farberware, KitchenAid, and Scanpan. But when it came to the ultimate quality of the cookware set, only 1 kitchen cookware set remained. Besides All-Clad being built so well, I like what it does for my cooking. Start with a thick pork chop or steak. Preheat the All-Clad stainless steel skillet on the stove at medium high heat for about 3 minutes. Preheat the oven to 350 degrees. Add 1 tablespoon of your favorite healthy oil. Lower the heat to medium. Just before it starts to smoke put your seasoned pork chop or steak in the skillet and let it saute for a few minutes. The bottom side of the food will caramelize and create some awesome flavors. Flip the thick food over and place it in the oven. Insert your thermometer and set it to beep when it hits the ideal temperature. That is good pan roasting! An All-Clad stainless steel cookware set gives the home cook a lot of choices. It can be used with any cooking method, whether it is pan roasting as mentioned above, braising in the stock pot or 3qt saute pan, or poaching your favorite chicken or salmon. 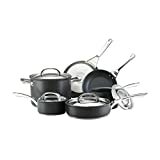 The cookware set can be used on induction stoves, put into the dishwasher, and all without worrying about harmful chemicals leeching into the food. While All-Clad cookware cost more than most, it is cookware that can truly last a lifetime. It is well built. It is a tad heavier than most, but that is a good thing. It won’t warp when de-glazing a sauce. As a 9-piece set it is a little small. I’d like to see a 12″ skillet added to the set. It does need a nonstick skillet for delicate foods like eggs and fish. Fully clad with aluminum core Excellent heating abilities. No hot spots. Stainless steel handles Easy to hold. Stays cool. This All-Clad Copper Core Cookware Set Review awards the All-Clad Copper Core as the best quality Copper Cookware Set and best healthy waterless cookware alternative. This is All-Clad’s flagship cookware line. If one is considering a waterless cookware system but questions if they can follow the waterless cooking requirements, spend the dollars on this All-Clad cookware line and learn to cook healthy. This is chef quality cookware at it’s finest. With an internal layer of copper, surrounded by aluminum, and then stainless steel, this 5-ply copper cookware is healthy, durable, dishwasher safe, and induction ready. In my reviews of copper cookware, the All-Clad Copper Core Cookware line stands out as a great performer. It is not inexpensive. Copper costs a lot. But in terms of copper cookware, the All-Clad Copper Core cookware set is unmatched by anyone. Whether for yourself or as a gift to someone else, people love new cookware! Perhaps your cookware doesn’t match, or it is chipped and peeling. Does it lay flat on the stove or do oils puddle in a corner? Maybe yours sticks too much, doesn’t perform the way you would like it to, or perhaps you want a cookware set that is dishwasher safe. You may have noticed scratches on the cooking surface, and concerned about the internal aluminum affecting your health. Maybe the handles get too hot or don’t fit your hand very well. Maybe you think of your cookware as being ugly. Perhaps you would like some that heats evenly and is easy to clean. If you are like me, I have some cookware that has been passed down from my parents and other family members. I have a little bit of everything. I know I get tired of some pieces that don’t lay flat on my flat top stove causing butter to collect on one side. It would be nice to have comfortable handles that stay cool, heats evenly and all the way up the sides, and maybe even uses less heat. And it would be great if that cookware could last for many years to come! In reviewing copper cookware sets, I found one that stands above the rest when it comes to QUALITY. There are many brands to consider including All Clad, Calphalon, KitchenAid, Mauviel and Bourgeat. But when it came to the ultimate QUALITY of the copper cookware set, only 1 copper kitchen cookware set remained. Copper is the best cookware material as it heats quickly and evenly. Heat disperses along copper better than aluminum or stainless steel. Copper is found in cookware in one of two ways. First it can be found on the exterior of cookware. This gives a very attractive look but can be difficult to maintain. These are rarely dishwasher safe as the harsh dishwasher chemicals will discolor the expensive copper. Second, copper is found clad inside of cookware usual sandwiched between aluminum. All-Clad Copper Core is this second category. Copper is never used on the inside cooking surface as it reacts with food and is toxic. When sandwiched within a 5-layer cookware, surrounded by aluminum and stainless steel, the copper is able to spread the heat evenly throughout the utensil, and with minimal heat from the stove. Fully clad up the side walls provides the best even heat, especially useful for thicker soups and sauces. It can be outrageously expensive as many of these products are sold exclusively through distributors which adds several layers of cost. The marketing is often done at trade and home shows for the impulse buy where a well planned out demonstration hits the hot buttons of the participants. Waterless cooking, when done right, has it’s own cooking method and requires the owner to throw away the vast majority of stored recipes in order to get the claimed benefit. If one is to talk about healthy living and healthy cooking, that is an excellent discussion to have. The bottom line is that a quality stainless steel cookware set like the All-Clad Copper Core can provide virtually the exact same benefits of waterless cooking without having to change recipes and spend unnecessarily more money. The first thing you’ll notice is how solid and sturdy the cookware feels. Then, when you heat it up, it surrounds food with the most even heat possible. Cooks know the value of the importance of even heating. While this All-Clad Copper Core Cookware Set Review says the cookware is dishwasher safe, because of the exposed copper, it is still best to wash by hand. The copper will tarnish when used in the dishwasher, but can be cleaned. Because it can handle the broiler and 4540 degrees in the oven, one can use all kinds of cooking methods including one of my favorites, pan roasting. Start by sauteeing a thick pork chop or steak on top of the stove, flip it and insert in the oven to finish cooking. It gives the cook time to complete other parts of the meal while perfectly cooking a thick food. No more warped cookware, mismatched sets, or scratched cookware. Say hello to a set that heats quickly, evenly, is dishwasher safe and durable. Very solid. Will last generations. Will still need a nonstick skillet for delicate cooking like eggs and fish. See Scanpan. Dishwasher safe Easy to clean. Hand washing still recommended though. Rave reviews. Everyone who uses Copper Core simply love it! You may be wondering how a cookware set can be so costly and if it can be worth the price. Consider that this will probably be the last set you will ever buy, it is future proofed induction ready, and with all the other benefits it has, it is a slam dunk decision. No, it is not inexpensive, but value is about more than just cost. This All-Clad Copper Core cookware set review sees the All-Clad Copper Core cookware from a different perspective than most. I get questions from folks asking about waterless cooking systems. Because of how they are marketed, they are very expensive, often many thousands of dollars MORE EXPENSIVE than this All-Clad Copper Core. The problem I have with waterless systems is that one has to cook in a particular manner to get all the benefits. A lot of cooking methods have to be discarded. One can learn to cook healthy with the All-Clad Copper Core and save money compared to a waterless cooking system. Stainless steel is a healthy cooking material. When one has the means and wants to cook healthy, there is no better choice than All-Clad Copper Core. This Cuisinart MultiClad Pro Cookware Set Review is both a review and an award. Cuisinart Multiclad Pro Cookware is a stainless steel cookware set that is affordable, healthy and dishwasher safe. It is near All-Clad quality at a fraction of the cost. A Cuisinart MultiClad Pro cookware set is beautiful brushed stainless steel on the outside and shiny 18/10 stainless steel on the inside. It is durable, induction ready, and has a very flat bottom, great for all range tops, especially flat top stoves. Perhaps you have mismatched cookware, or cookware that is chipped or peeling. Maybe it doesn’t lay flat. Maybe it sticks too much. Perhaps you want a cookware set that is healthy. You may have noticed scratches on the cooking surface, your current cookware handles get too hot, or the cookware is heavy. Perhaps you would like cookware that is dishwasher safe and easy to clean. If you are like me, I have some cookware that has been passed down and more than 40 years old. I know I get tired of some pieces that are warped and don’t lay flat. It would be nice to have cookware with comfortable handles that stay cool, heats evenly and all the way up the sides of the cookware, and maybe even use less heat. And it would be great if that cookware were available for a fair price! In reviewing all the stainless steel cookware sets, I found one that stands above the rest when it comes to QUALITY and VALUE. There are many brands to consider including All Clad, Calphalon, Cuisinart, Farberware, KitchenAid, and Scanpan. But when it came to quality of the cookware set AND offered at a great price, only 1 kitchen cookware set remained. No more mismatched sets, or scratched cookware. Say hello to a cookware set that is nearly indestructible, dishwasher safe, and healthy. Yes, I like All-Clad stainless steel cookware, but when one can get near All-Clad performance for a fraction of the cost, that is a great value. I have some Cuisinart Multiclad Pro and I use it almost all the time. It can take higher heat levels. I employ a lot of cooking techniques and this is a requirement. It surrounds food with an even heat. Whether cooking rice, oatmeal or a thick soup, being fully clad really helps. The handles feel better than most. I need to have confidence it’s not going to slip when I carry a hot pot of food across the room. It lays flat on my GE flat top stove. This helps the cooking process avoiding hot spots. It’s easy to clean whether by hand or in the dishwasher. Oven safe to 500 degrees really comes in handy when you pan roast food! Cuisinart bundles a steamer in the 12-piece set – great for healthy cooking! A larger 12″ or 14″ skillet would really make a great addition. The addition of their GreenGourmet nonstick skillet would also make the set very complete. Tri-Ply aluminum clad all the way up the side walls for Heat Surround technology Uses less heat and provides superior even heat around food. Cooking Should Be Fun… Now You Can Make It Healthy. So many people are switching to stainless steel cookware because it is non-reactive with food, and does not give off harmful fumes, chip, or peel. Quality cookware like the Cuisinart MultiClad Pro does not require the high heat of other brands, but can handle it when you need it. You will find that you only need to use low to medium heat to get the same heating levels. Cleaning is easy with a mild powder cleanser like Bon Ami or Bar Keepers Friend and a nylon pad. Cuisinart MultiClad Pro – Awarded the Best VALUE stainless steel cookware set. This Anolon Advanced Cookware Set Review is both a review and award presentation. The Anolon Advanced cookware set is my winner for “Best Quality” hard anodized aluminum cookware sets. Well constructed, nonstick both inside and outside, exceptional stay-cool handles, straining lids, easy pour spouts, and a very flat bottom are ample reasons for the award. Anolon, a Meyer Corporation company, makes several high quality aluminum cookware lines. Anolon Advanced has a long history of great reviews. People enjoy cooking when they have new cookware! Perhaps you have several brands and styles of cookware, or some that is scratched and peeling. Maybe they are slightly warped and don’t lay flat. Maybe your cookware sticks too much, and perhaps you want a cookware set that is easy to clean. You may have noticed scratches on the cooking surface, the handles get too hot, or it’s just too heavy. Perhaps you would like cookware that heats evenly and lays flat on the stove surface. If you are like me, I have some cookware that has been passed down from my parents and family members. I know some of it is at least 30 years old, and it shows! I know I get tired of the pieces that are warped and don’t lay flat on my GE ceramic top stove. It would be nice to have cookware with comfortable handles that stay cool, heats evenly and all the way up the sides of the cookware, and maybe even uses less heat. And it would be great if that cookware could last for many years to come and still look great! You can put all your mismatched, old scratched and warped cookware aside because I have an excellent cookware set for your consideration. In reviewing all the hard anodized aluminum cookware sets, I found one that stands out for PREMIUM QUALITY. There are many things to love with this cookware set. This Anolon Advanced Cookware set review includes both what I liked and didn’t like. It is very well constructed. The first impression is that it is built to last for generations. It has a very flat bottom perfect for any stove top, but especially the flat top stoves. The handles are also a tad large which really helps when carrying a pan of hot food. Even though it is not dishwasher safe, it does clean up very easily by hand. I like the glass lids so one can see the food cooking without having to let out the heat. The saute pan that comes with the set is a great addition to the normal 8″ and 10″ skillets. I like the included sauce pots in a cookware set. Any cook will have plenty of pots and pans to cook with. The 8 qt stockpot is also a good addition for cooking pasta, corn on the cob or a very large stew! The aluminum construction underneath the nonstick surface heats all the way up the side walls and surrounds food with an even heat. It’s not dishwasher safe. Even though it’s easy to clean, it would be easier if it could go into the dishwasher. Like most traditional nonstick cookware sets, don’t use any heat settings above medium high. While it does get hot fast, and heat evenly, sometimes chefs like that extra high heat setting to really sear that food quickly. It’s more difficult getting that brown sear on scallops without that extra heat. Three layer DuPont Autograph 2 nonstick surface offers enduring nonstick performance The best by DuPont. Quality. Easy to clean. Avoids common anodized aluminum issues. Ergonomic SureGrip stainless steel and silicone handles Easy to hold. Stays cool. Break resistant domed glass lids with SureGrip handle Easy to see food cooking. Lid handles stay cool. Hand wash only – not dishwasher safe The nonstick coating on inside and outside makes it easy to clean by hand. One of the biggest advantages of owning a new and complete cookware set is that all of your cookware matches! No more having some cookware that is white, black, silver, orange, or any other color. They will all be the same uniform color. AND THEY WILL ALL COOK THE SAME! Forget trying to remember how each piece heats, cools, or handles certain cooking tasks. A PREMIUM QUALITY cookware set like the Anolon Advanced 11 piece cookware set takes the guess-work out of cooking. You will own a well constructed and attractive set of cookware. When I was preparing this Anolon Advanced cookware set review, I look at many cookware sets. There are abundant reasons Anolon Advanced deserves the award. 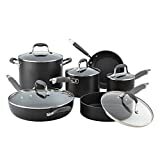 Besides my own personal experience with the cookware which I can attest to, here are other details about the cookware set as well as comments from other users as posted on Amazon.com.